I had wanted to make blueberry muffins for quite awhile. About a month ago, my grocery store advertised what seemed to be an excellent sale on fresh blueberries, blackberries and strawberries. I was thrilled about the prospect of making luscious blueberry muffins, but disappointed when I laid eyes upon the tiniest carton of fresh berries I had ever seen! Since the quantity didn’t seem worth the price, I walked away. After finishing up at the grocery store, I hit the Target next door to complete my grocery shopping. While wandering the frozen food section, I saw that frozen berries were on sale. On a whim, I picked up a bag of blueberries… and promptly forgot about it. I finally used the frozen berries when my mother joined me for tea on a recent afternoon. I wanted a something freshly-baked to serve with our Lady Grey tea, so I scoured my Google Reader for a fun recipe. 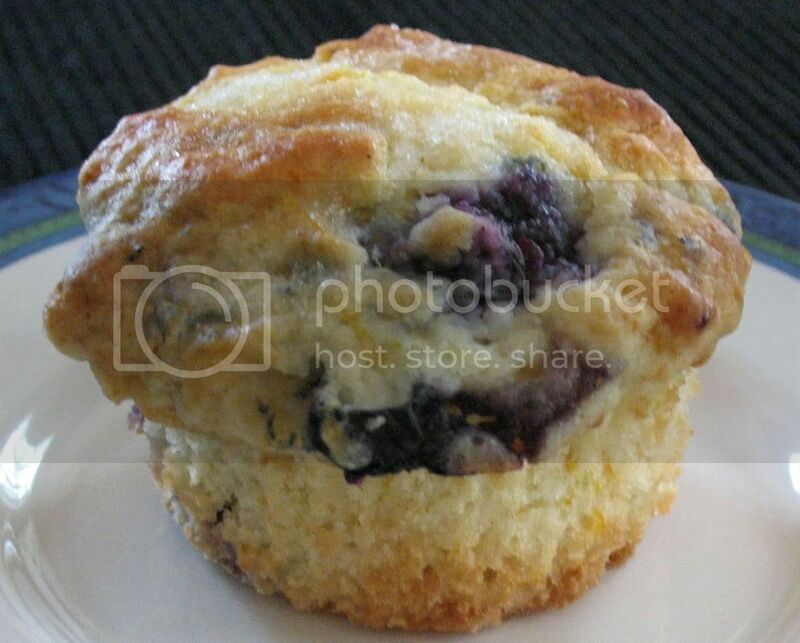 I initially saw these muffins on Dinner & Dessert, but found the actual recipe text here. This recipe comes from Dorie Greenspan’s Baking: From My Home to Yours. I’m looking forward to checking out other recipes from this cookbook. I made the recipes during my lunch break (on of the benefits of working from home!) and was pleased at how quickly they came together. Since the butter had to cool after being heated, I melted it before I started working on juicing and zesting the orange. The juice and zest add a lovely citrus punch. It’s a fun change from your typical blueberry muffin. The muffins themselves are soft, buttery and moist. Mike: So, what’s for breakfast today? Beth: Toast…eggs…something like that. The usual. Mike: We’re not having those orange blueberry muffins? I thought you said you were making them. Mike: Oh, I must have dreamed that. Pour the orange juice into a large glass measuring cup or a bowl and pour in enough buttermilk to make 1 cup. Whisk in the eggs, honey and melted butter. In a large bowl, rub the sugar and orange zest together with your fingertips until the sugar is moist and the fragrance of orange strong. Whisk in the flour, baking powder, baking soda and salt. Pour the liquid ingredients over the dry ingredients and, with the whisk or a rubber spatula, gently but quickly stir to blend. Don?t worry about being thorough – the batter will be lumpy and bubbly, and that?s just the way it should be. Stir in the blueberries. Divide the batter evenly among the muffin cups. Bake for 22 to 25 minutes. If you want to top the muffins with decorating sugar, sprinkle on the sugar after the muffins have baked for 10 minutes. When fully baked, the tops of the muffins will be golden and springy to the touch and a thin knife inserted into the center of the muffins will come out clean. Transfer the pan to a rack and cool for 5 minutes before carefully removing each muffin from its mold. *I did 1 tbsp vinegar then fill up to the 1 cup line with milk. Then I used this mixture for the required buttermilk. I keep meaning to make some muffins as grab and go breakfasts and this looks perfect! Erin – I’m so glad you posted these muffins – it’s my new favorite recipe! Gaga – Give them a try… you won’t regret it!